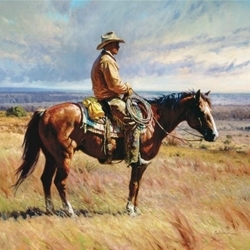 This is one of Martin Grelle's personal favorites within the cowboy genre. It was painted in a square format which is somewhat unusual for the artist. "An American Icon" is the quintessential western piece - the embodiment of the cowboy. Martin Grelle is a member of the Cowboy Artists of America and is one of the leading artists depicting western and cowboy art, and native american indian art. Martin Grelle is always a top seller at Mountain Traditions.